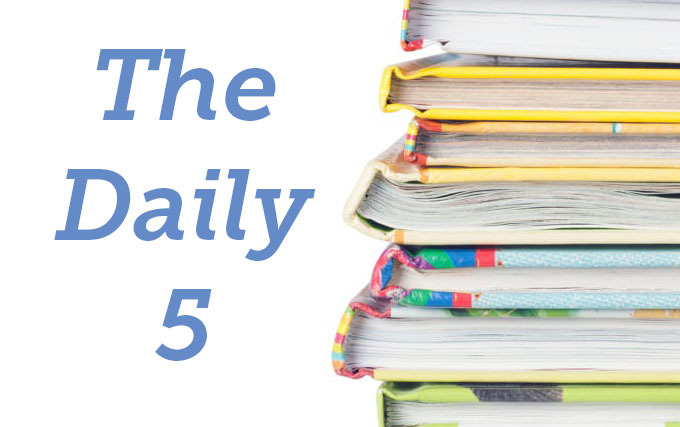 The Daily 5 is a popular curricular framework for literacy instruction. The book was originally published in 2006 by Gail Boushey and Joan Moser, these guidelines help teachers provide structure for students' self-guided exploration, enjoyment, and practice of reading and literacy activities. The Montessori teacher in me appreciates that this method encourages flexibility and autonomy for the students and the teacher. This post explains the basics of the framework and provides easily adaptable ideas for inclusion in your classroom routine. As a student-centric framework, with few occasions for teacher-led, large group instruction, this style of teaching may take some adjustment time for both educators and students. However, the benefits of the method provide much more for students than the explicit instruction, and are well worth the initial effort. For example, by placing control in the hands of each student, they learn self-regulatory skills like time management, self-awareness, and self-confidence. Well-implemented, this method will build trust between teacher and students, allowing students to really feel that they are each capable of mastering their own learning goals. Every classroom environment is different, and every implementation of the Daily 5 will be different. This is good! Be flexible in your preparation and willing to adapt the offerings to keep students eager and engaged. Constant and careful observation of your students' interests, behaviors and work products will help to guide your decisions about how to guide your students. Seeing what piques their interest will tell you what to offer next to maintain their focus and excitement. Watching their energy and focus levels will help you to know how long to allow Daily 5 sessions to run. As students become more adept at self-regulation and increase their learning stamina, sessions can be extended. The first step to preparing your environment for independent work (especially in classrooms where this has not previously been the case) is to set clear boundaries. The Daily 5 method provides students just five options for work during the allotted time. Explicitly demonstrate each option and communicate the purpose clearly to your students. You can (and should!) vary the activities associated with each choice to keep students' interest and provide increasing challenge. However, the choices themselves remain constant so students internalize the parameters of the work they are trying to accomplish. As student stamina and interest grows, you can increase the amount of time spent on the Daily 5. Click the title of each section to visit The Daily Cafe for even more information and ideas. Curate your classroom library with titles centered around a particular theme. Draw attention to areas of interest in the school library with color coded balloons or arrows pointing to shelves or specific titles. Remember to include a variety of text formats - curate a class website with links to appropriate sites or download pdfs that students can read on tablets. Tie in peer writing by creating "We Write" area with papers, pamphlets, and books written by classmates. You can partner with another classroom and share work to build community between classes, too! Create a cozy corner with just enough room for the number of reading pairs you want to allow. For example, keeping only four floor pillows creates a natural boundary - only four people can sit. 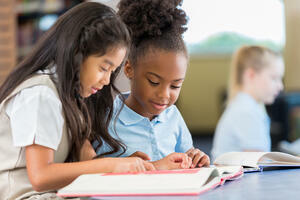 If your challenge is reluctant readers, create a system for reading buddies in which students can invite a friend either to be read to or to do the reading. Extra incentives like a canopy or tent can help reluctant readers feel less like they're out in the open. Writing for Self - Giving students the resources to write for themselves allows them freedom to make mistakes and challenge their own creativity. Writing journals can be used for self-reflection, practice responding to prompts, or just record keeping. If you are using a single notebook for all types of journaling, consider allowing students to fold down pages they've written just for themselves so you can still monitor their other progress without intruding on their private work. Writing for Others - Writing for others is an enticing option when the topics are endless and students can choose for themselves. Students can write papers, pamphlets, or books to keep in the "We Write" area of the classroom library where others can learn from them and enjoy their work. Partner with the art department to teach students related skills like design, layout, and even bookbinding techniques. Set clear boundaries from the start in this area by providing a focus for Word Work activities. Constrain the work to focus on word properties (word families, similar sounds, synonyms) or limit the materials to be used (individual whiteboards, seats at a group work table). Limit the time students spend in this area with instrumental music. The meditation sounds provide non-verbal clues about when time's up. Technology and audiobooks make this option the least work for implementation. Show students how to access the Tales2go library and allow them to choose their own stories for listening. If students struggle to find titles amid the vast selection, curate titles by saving to the communal favorites or save bookmarks to their personal accounts. Listen to a friend (scroll back up to #2). Help students focus on the audio by providing quiet listening activities to engage their hands while they listen. Soothing activities like coloring (detailed color by number/letter holds older students' interest), or playing with slime work well. Ask students to complete graphic organizers to help solidify concepts and meaning. Conclude your Daily 5 sessions with self-reflective evaluations. Give students time to document their own work for the day, allowing you and your students to track their progress, and ensure even exposure to all the areas, and remember where they are at the start of the next session. Self-tracking helps students to see where they started and begin to form a plan for what they'd like to accomplish next - important for self-regulation.